Low Fouling— The chemical composition of Therminol XP has been carefully selected to minimize system fouling resulting from oxidation and degradation of the fluid. Practically Non-Toxic—Meets the purity specifications in U.S. Food and Drug Administration Regulation 21 CFR 172.878. Listed as a Registered Nonfood Compound by NSF International (Category Code HT-1: Heat transfer fluids - Incidental contact). 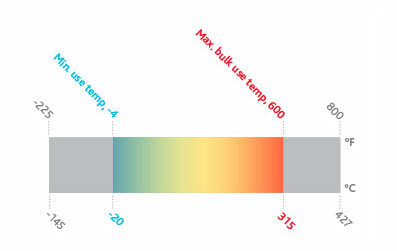 Thermal Stability—Users can expect many years of reliable, trouble-free operation, even when operating Therminol XP continuously at the recommended maximum temperature of 315°C (600°F). Environmentally Friendly—Therminol XP has outstanding regulatory status for those seeking heat transfer fluids which have minimum environmental reporting requirements.